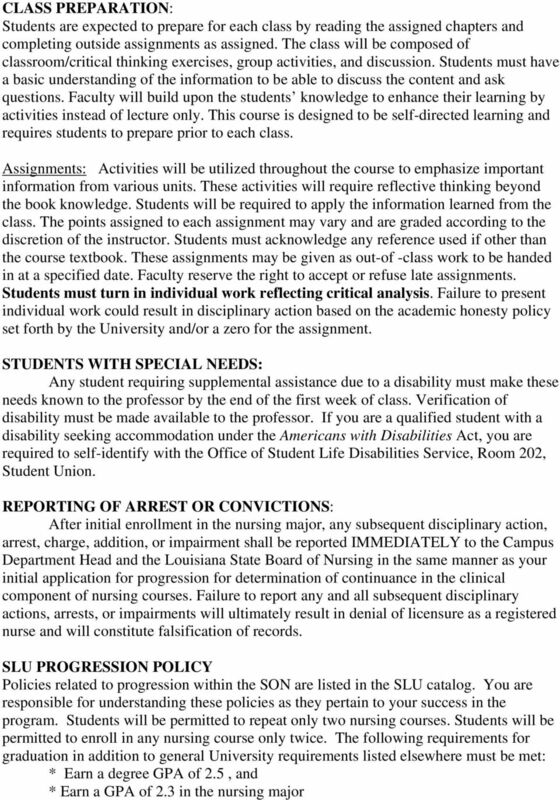 Download "SOUTHEASTERN LOUISIANA UNIVERSITY School of Nursing Spring, 2004. Completion of all 200 level nursing courses"
1 SOUTHEASTERN LOUISIANA UNIVERSITY School of Nursing Spring, 2004 COURSE NUMBER: Nursing 378 COURSE TITLE: COURSE CREDIT: CONTACT HOURS: PLACEMENT IN CURRICULUM: PREREQUISITES: FACULTY: Research in Nursing Two credit hours Two hours class per week 300 level courses Completion of all 200 level nursing courses Karen Hill, PhD, RN Office: Mims Hall, Room 127 Phone: Fax: (Office hours posted on door) COURSE DESCRIPTION: Focuses on the history, terminology, and the process of nursing research. 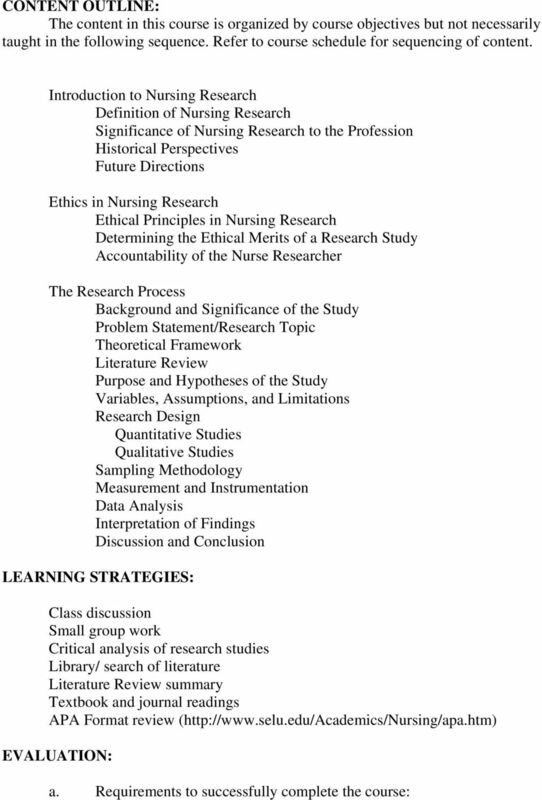 Emphasizes nursing research as a basis for nursing practice. 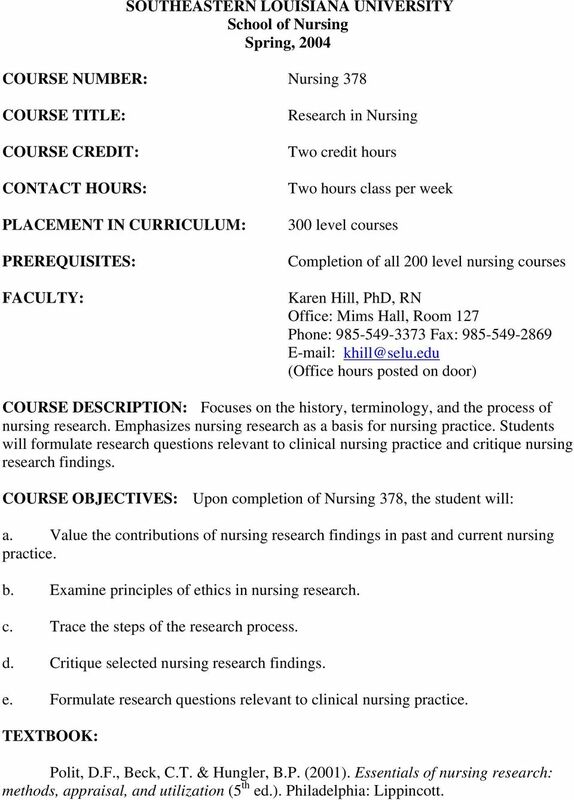 Students will formulate research questions relevant to clinical nursing practice and critique nursing research findings. COURSE OBJECTIVES: Upon completion of Nursing 378, the student will: a. Value the contributions of nursing research findings in past and current nursing practice. b. Examine principles of ethics in nursing research. c. Trace the steps of the research process. d. Critique selected nursing research findings. e. Formulate research questions relevant to clinical nursing practice. TEXTBOOK: Polit, D.F., Beck, C.T. & Hungler, B.P. (2001). Essentials of nursing research: methods, appraisal, and utilization (5 th ed.). Philadelphia: Lippincott. 3 Students must satisfactorily pass the course with a grade of 79% based on points earned divided by total possible points. Students may not progress to the next nursing course unless Nursing 378 has been completed with a C or better. b. Method of grading and/or grade scale: Final grade will be determined by the following: Exams (3) points Individual Work: Article summary 10 points Quantitative Critique 15 points Qualitative Critique 10 points (part of final) Article Bibliography 3 points Two articles for group work 3 points Submission of Research question 2 points Group work 2 points Other Assignments points TOTAL points The final examination will not be comprehensive. Exams will reflect all classroom activities and reading assignments. Please bring a scantron to class the day of the test (Form No ). Scantrons will not be available from the faculty. Students are not allowed to wear hats of any kind or wear sunglasses during a test. Students should attend to personal needs prior to the exam. If you are ill on the day of the test, attempt to notify the instructor first, prior to class time. If you are unable to contact the instructor, call the Nursing Department Secretary (504) Contact the instructor no later than three (3) days after returning to school to present an excuse. Make-up exams are given for excused absences only. 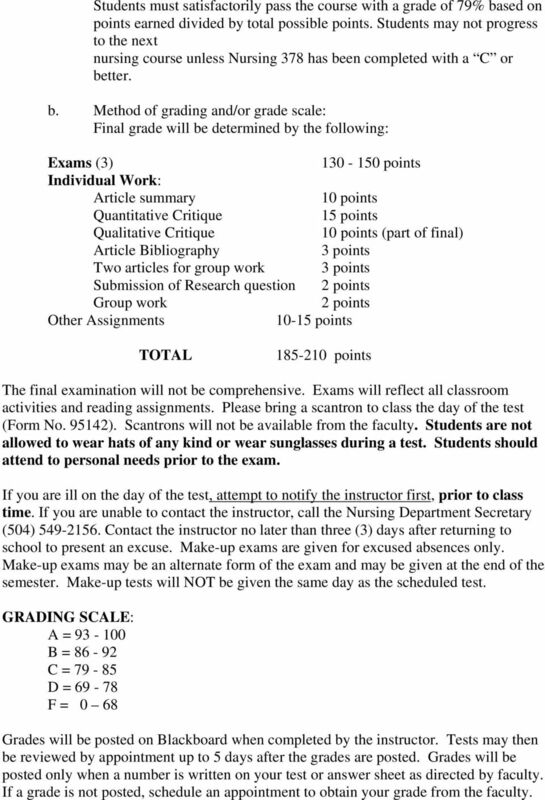 Make-up exams may be an alternate form of the exam and may be given at the end of the semester. Make-up tests will NOT be given the same day as the scheduled test. GRADING SCALE: A = B = C = D = F = 0 68 Grades will be posted on Blackboard when completed by the instructor. Tests may then be reviewed by appointment up to 5 days after the grades are posted. Grades will be posted only when a number is written on your test or answer sheet as directed by faculty. If a grade is not posted, schedule an appointment to obtain your grade from the faculty. 4 Test grades are not given over the telephone. Please do not call the secretaries about course grades. It is against university policy for grades to be reported over the telephone. CLASS ATTENDANCE: Refer to for attendance policy. CONDUCT: Students are expected to comply with Standards of Conduct as outlined in the Special Student Guide. 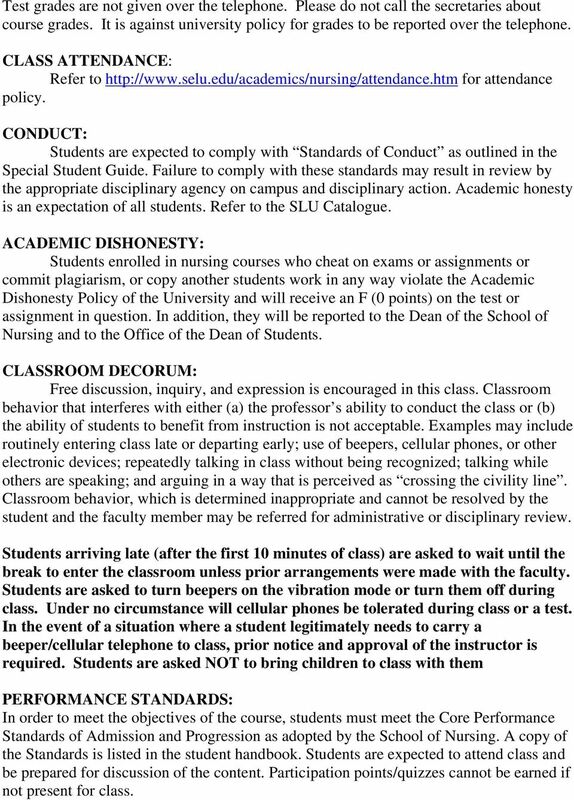 Failure to comply with these standards may result in review by the appropriate disciplinary agency on campus and disciplinary action. Academic honesty is an expectation of all students. Refer to the SLU Catalogue. ACADEMIC DISHONESTY: Students enrolled in nursing courses who cheat on exams or assignments or commit plagiarism, or copy another students work in any way violate the Academic Dishonesty Policy of the University and will receive an F (0 points) on the test or assignment in question. In addition, they will be reported to the Dean of the School of Nursing and to the Office of the Dean of Students. CLASSROOM DECORUM: Free discussion, inquiry, and expression is encouraged in this class. Classroom behavior that interferes with either (a) the professor s ability to conduct the class or (b) the ability of students to benefit from instruction is not acceptable. Examples may include routinely entering class late or departing early; use of beepers, cellular phones, or other electronic devices; repeatedly talking in class without being recognized; talking while others are speaking; and arguing in a way that is perceived as crossing the civility line. Classroom behavior, which is determined inappropriate and cannot be resolved by the student and the faculty member may be referred for administrative or disciplinary review. Students arriving late (after the first 10 minutes of class) are asked to wait until the break to enter the classroom unless prior arrangements were made with the faculty. Students are asked to turn beepers on the vibration mode or turn them off during class. Under no circumstance will cellular phones be tolerated during class or a test. In the event of a situation where a student legitimately needs to carry a beeper/cellular telephone to class, prior notice and approval of the instructor is required. Students are asked NOT to bring children to class with them PERFORMANCE STANDARDS: In order to meet the objectives of the course, students must meet the Core Performance Standards of Admission and Progression as adopted by the School of Nursing. A copy of the Standards is listed in the student handbook. Students are expected to attend class and be prepared for discussion of the content. Participation points/quizzes cannot be earned if not present for class. 6 Last day to resign from the University or withdraw from classes: Address: Friday, March 19, 2004 All students will be required to use their address provided by SLU. Frequent memos, information updates, etc. will be sent via . Students are required to check for from the instructor several times during the week. The posting times for messages will be as follows unless directed otherwise in class. Wednesday Class Monday, Tuesday, Thursday I do not usually check for s during the weekend.